Basic Information: What are Ultrax Labs Hair Rush Supplements? This review for Ultrax Labs Hair Rush Supplements will help inform and advise customers on whether or not to purchase this product. Ultrax Labs supplements are designed to treat various facets of hair loss by accelerating max hair growth, increasing hair thickness and decreasing hair loss for both men and women. Ultrax Labs supplements also claim to be different from other hair regrowth products in the market; as they work as to completely nourish and support proper follicular function. 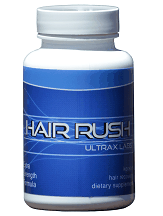 Ultrax Labs Hair Rush Supplements are available online from their official website. Ultrax Labs consists of twenty essential vitamins, minerals and herbs designed to treat hair loss. Customers should ingest two Ultrax Labs supplements twice daily. Ultrax Labs supplements are available from their official website. One bottle, containing thirty tablets is available for the discounted price of $59.99, $10.00 off of the original price of $69.99. I have started taking the Ultrax Labs supplements for almost two months now. I have noticed some signs of improvement, but not as much as I was lead to believe from their claims and other customer reviews on their official website. My once thinning hair is now growing out very slightly thicker. The change is hardly noticeable. I am slightly disappointed by these results. However, the official website states that best results can be expected after using the product for a minimum of ninety days. More progress might be observed after one more month of use. The official website does not offer much in the way of medical information concerning their product. However, customers should not exceed the recommended dose. If any side-effects are observed, stop taking the product immediately and consult a doctor. Ultrax Labs offers a full ninety day 100% money back money back full-satisfaction guarantee for their products. Many customer reviews are available for this product on their official website. However, the large number of customer reviews coupled with the overwhelming majority of customers giving this product a very positive five-star review raises a few eyebrows. This leads me to believe that these reviews, or at least a number of them, may be fabricated. Ultrax Hair Rush Supplements are capsules designed to decrease hair loss and support the growth of thicker, healthier hair. Ultrax Labs offers a very good ninety day full money back guarantee and the fact that this product is a tablet means that it offers a less time consuming treatment for hair loss compared to their other topical shampoo and conditioner products. However, the product comes with a very steep price, even with the discounted price, since each bottle, available at a discounted price of $59.99, is only enough for half a month’s supply. The true effectiveness of this product is also called into question, as my experience with this product does not match the testimonials at all, and they seem far too numerous and far too positive for a product like this.